Some may look at this and see a tempting side dish. I however, look at it and see dessert in an earthenware dish. Since butternut squash is already pretty sweet in its own rite, when it's given any sort of "sweet treatment", it seems like a satisfying way to wrap up a meal. Don't get me wrong, I love roasting squash with a dab of oil and some seasoning and eating alongside some roasted turkey, or atop a bed of winter greens, or even tucked into a hearty grain salad with fresh bursts of herbs. But when butter and brown sugar come a knockin', this dessert train's a rockin'! Let me also just throw it out there that the sweetness is tempered beautifully by the addition of a few errant bay leaves. It's funny, really. You can't imagine the impact these unassuming little leaves can make. Oh, and p.s.- if you don't want to bother with the whole pesky peeling-a-winter-squash-thing? Don't. Once roasted, the skin turns beautifully chewy and palatable. I actually look forward to the outside bits the most. Remove the seeds from the squash. Cut into slices that are ~½" thick. You can peel it if you like, but I like the chewiness that results from roasting it unpeeled. Preheat oven to 350° F. Rub the bottom and sides of a baking dish with a bit of butter. Sprinkle a little brown sugar over that. Lay the squash in a single layer. Sprinkle with a bit more brown sugar. Sprinkle a couple good pinches of sea salt over that. Tuck a couple of bay leaves in and around the squash. Dot with a few more small blobs of butter. Add a splash or two of water. 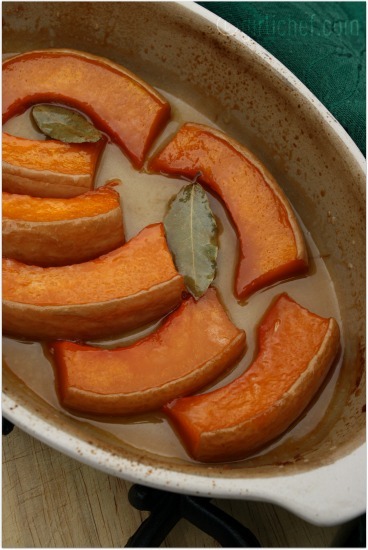 Slide into preheated oven and roast until squash is tender, basting occasionally. It's okay (actually it's wonderful) if you wind up with a few golden brown spots. Just take care not to let the squash get mush (unless of course, you like it that way...then roast away). Adjust this recipe by using a bit more (or less) of each ingredient and a larger baking dish. Baking time may be a bit longer for a larger amount of squash. You can serve it as a side dish, or (my personal preferance) as dessert. 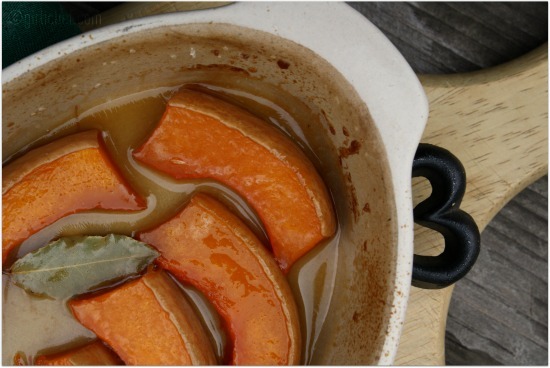 Roasted slices of butternut squash resting in a sticky syrup made from the sugar and butter reducing with awesome, grassy green undertones from the bay leaves. I think a small hit of finely grated lemon zest scattered over the top right as it comes out of the oven would add another dimension to the dish...a bit of a bright citrus finish. Sounds like all kinds of sweet and chewy goodness. I say it could be either dessert or a side. It would be lovely with ham. Dang, it's swimming in happiness! I made this one awhile back and it was a big hit. We loved it. Yours looks so pretty with the skin left on. When I made this, I was skeptical about the bay leaves--even though I like them. But it works well. We liked this dish a lot. Wish I would have known about the no-peeling option! I just pinned this to my "recipes to try" in Pinterest. I will probably try with the few Delicata I have left! I eat the skin also! I actually find the spots near the skin to be sweeter. This is totally my kind of dessert. I might just have it for dinner though...cause I probably won't be able to restrain from eating the whole pot. Whether you label it sweet OR savory, it is excellent. Yum, I vote for breakfast or a side. This would be so awesome at a holiday meal! love the suggestion of being served on the side with ham, yummy! I love the simplicity. I would not have thought to add the bay leave but it makes sense. I add it in my blackberry jam and you're right about adding a touch of smoothness to the sweet. I look forward to trying this out. The wonders of butternut squash. What a great combo. I agree with you, this is an awesome dessert. The sweetness of this dish would just be perfect for a great dessert. I don't peel mine either, they are great just slice and bake, yum!! Hope you are having a wonderful week end and thank you so much for sharing with Full Plate Thursday. I agree, this looks like a dessert. The photo made it look delectable! I am saving this for Thanksgiving! YUMM!!!! Oh! Just the thought makes my cheeks tingle a bit. I think that would be a wonderful combo.